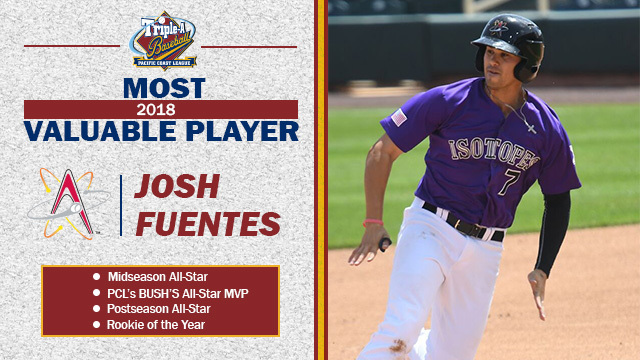 ROUND ROCK, Texas - A breakthrough season for Albuquerque Isotopes infielder Josh Fuentes has earned him the Pacific Coast League's highest individual honor - the Most Valuable Player award - the League office announced Friday. In one of the closer races in recent years, Fuentes beat out teammate Mike Tauchman to capture the League's 83rd annual award. Fuentes is the ninth player in franchise history to receive the honor, joining the likes of Joc Pederson (2014), Paul Konerko (1997) and Jose Offerman (1990). Fuentes, in his first year at Minor League Baseball's highest level, was also recognized as the League's Rookie of the Year. He is the first player since Pederson to win both awards in the same season. Fuentes' other accolades this season include an election on the PCL's mid- and postseason All-Star teams. The third baseman started for the PCL in the Triple-A All-Star Game; he hit a home run and tallied an RBI since to earn the League's BUSH'S® All-Star MVP. Additionally, his teammates selected him the team's best defensive player, as he was named the Isotopes Players' Choice Winner for Defensive Player of the Year. In 131 games for the Isotopes, Fuentes has tallied a League-high 171 hits. With a second inning single on August 30 against Sacramento, his 170th hit of the year, the California native established the franchise's single-season hits record. Fuentes also leads the PCL in total bases (270), while ranking second in a number of offensive categories, including extra-base hits (59), RBI (93) and runs scored (88). The fifth-year professional is also in the middle of the race for the batting title, as he has hit .319 (171-for-536). Tabbed by Baseball America as Colorado's No. 25 prospect entering the season, Fuentes has recorded a hit in 99 games this year and has never gone more than three games without one, collecting a season-high four hits on five occasions. He has a season-best 14-game hitting streak, from April 7-21, a stretch in which he hit .404 (23-for-57). Fuentes was the first player in Minor League Baseball this season to hit at least 10 doubles, 10 triples and 10 home runs, accomplishing the feat with a home run on July 27 at Colorado Springs. He also hit his first career grand slam on August 17 in Sacramento, a go-ahead home run in the seventh inning. Fuentes, who attended Saddleback College before finishing his collegiate career at Missouri Baptist University, went undrafted out of college. The cousin of Colorado Rockies All-Star Nolan Arenado, Fuentes has worked his way through Colorado's system, spending the entire 2017 season with Double-A Hartford. With the Yard Goats, Fuentes hit .307 (127-for-414) in 122 games and was named an Eastern League postseason All-Star. He has accumulated almost 600 hits in his professional career, hitting .294 (590-for-2005) in 538 career games. Ever since 1927, the PCL has recognized the League's Most Valuable Player. Fuentes was one of 11 players to receive votes from the PCL's field managers, media representatives, broadcasters and League officials. Joe DiMaggio (1935), Tony Perez (1964), Sandy Alomar, Jr. (1988, 1989) and Nelson Cruz (2008) are some former Major League All-Stars to have been the recipient of this prestigious award.